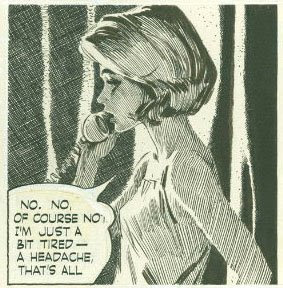 the photorealist style of daily strips had its heyday in the newspapers between 1947 and the late 1960s. Prof Mendez gives a first rate introduction to the subject. 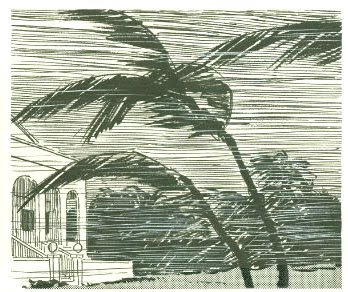 Alas it is a subject which tends to be given short shrift by the canon-making pedants of latter day comic strip scholarship, who draw an expressive artistic line from Feininger down to Panter, following the lead of the Masters of American Comics exhibition and book. (eg. Ed Howard's list of sept 17 is perhaps more conservative than that outline suggests, but it's true that he includes NO examples of the photorealist school). The contrary neatly inked line traced by the other camp, which tends at its worst to be reactionary in its cultural taste, tapers to a point at Dave Sim's latest offerings. Critic Douglas Wolk in his review of Sim's Judenhass of this weekend, seems almost incredulous that the once-popular school of comic strip art existed not just in Dave Sim's imagination: "Sim, in recent years, has been fascinated with the sort of “photorealism”—his word—practiced by a handful of comic strip artists of the 1950s and 60s, who were essentially trying to reproduce photographs as line drawings." 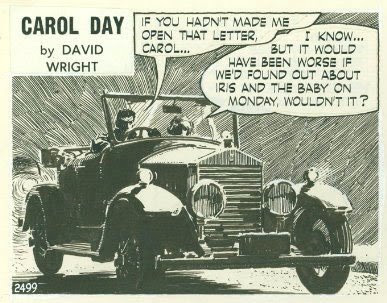 Elsewhere, Domingos Isabelhino draws my attention to recent additions to a site devoted to the English daily strip Carol Day by David Wright (1912-1967) which ran in the London daily Mail from 1956 until the artist's death. 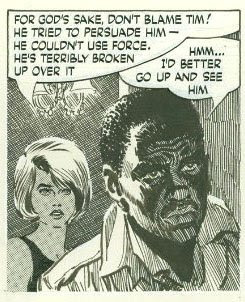 Domingos is describing the story which has been given the title, for the sake of orderliness I presume, 'Jack Slingsby': Can you imagine an American newspaper comic in which "the hero" (to speak children's comics lingo) is engaged to one character while she's having an affair with another character who's married (a slacker, no less!)? Can you imagine Mary Perkins following her heart against social conventions and doing that? I can't. No newspaper or syndicate editor would allow it. But that's exactly what happens in this masterpiece of the comics form. Wright was of an earlier generation than most of the artists working in the photorealist style, (though having said that I have to remind myself he was only two years older than I am now when he cashed in his chips.) and his design sense belongs to an earlier time. He tends to want to fill every nook and cranny of his drawings with noodling. The Carol Day site is run by Roger Clark and contains a huge inventory of material that is worth a moment or two of your time. Hi Eddie, Thanks for the links, they have kept me happily occupied for several hours now. Lots of beautiful work highlighted there, with interesting commentary. I was brought up a bit short by your harsh comment at the end of Douglas Wolk's review of Judenhass. Do you have some past history with him that justified that? If not, it seemed a small, debatable point in a piece that was mostly about other topics, and not worth questioning all of his critical abilities over. It seemed unworthy of you, but of course you can be the only real judge of that. Best wishes, and thanks for all your wonderful work. b) there were a great deal more than a 'handful' of proponents of the style. I could come up with a list of thirty or forty overnight. c) it would not have been hard to check the facts. Upon reflection, it certainly is unreasonable of me to pick on the poor wee fellow like that. I guess I'm taking out my frustration at having to sit through the interview I linked to her on 9 sept, where the interviewer demanded i explain the difference between a comic and a graphic novel, on the person who wrote a book with the unbelievably annoying title "Reading Comics: How graphic novels work and What they mean."